Inventory We are a resale marketplace, not a box office or venue. Ticket prices may exceed face value. This site is not owned by State Farm Center . 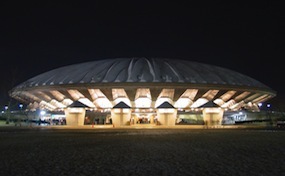 State Farm Center, formerly known as Assembly Hall, is a large dome-shaped indoor arena, located in Champaign, Illinois, and is part of the University of Illinois. The State Farm Center hosts games for the Fighting Illini men's and women's NCAA basketball teams, and doubles as a performance and event center. Student at The University of Illinois Champaign-Urbana campus refer to the State Farm Arena as "The House of Paign" and "The Orange Krush". As the 3rd largest arena in the State of Illinois The State Farm Center has 16,000 permanent seats. The State Farm Center is also the venue for the annual News-Gazette Broadway Series, which has included hits like: Les Miserables, Miss Saigon, rent, and Fiddler on the Roof. StateFarm.CenterChampaign.com is not a primary vendor, supplier, or affiliated with any official website. We are an independently owned and operated company that concentrates solely in the online retail of tickets in the secondary market. Ticket prices may be well below or above face value and will fluctuate with the market. To purchase tickets for all State Farm Center Champaign, Illinois Events simply click on the show of interest or call our operators at anytime.